Food2Kids executive board members pose with their 2019 Organization of the Year award. From left, Kamie Amos (campus outreach director), a fourth-year management information systems student from Dalton; Vallie Candler (co-president), a fourth-year marketing and Spanish major from Atlanta; Carly Esposito (co-president), a fourth-year exercise and sport science major from Milton. 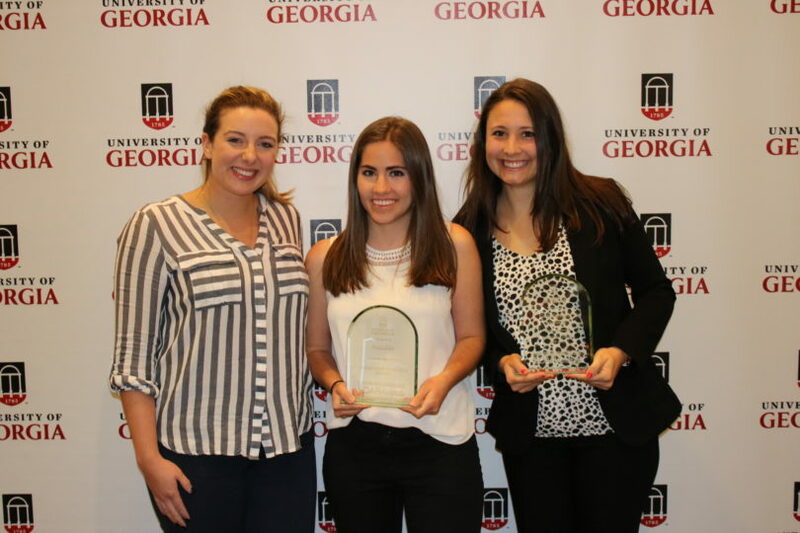 Most Innovative Program: UGA Votes for its efforts to increase voter registration among students. Organizational Improvement: Pre-Counseling Club for working to increase intentional membership among students hoping to enter “helping professions” and become counselors. Organizational Collaboration: Journal of Language & Literacy Education and the Language & Literacy Education Graduate Organization for working together to increase participation and resources for their Fall Speaker Series and Winter Pre-Conference Workshop. Outstanding Campus Event (Small): ServeUGA’s “Dawg Day of Service” for inspiring 428 students to volunteer at 18 sites across the community, resulting in 1,040 hours of service. Outstanding Campus Event (Large): Shop with a Bulldog for supporting local children and families with a shopping and entertainment program during the holiday season. Outstanding New Organization: Girls in Healthcare for providing a positive, supportive network for female students pursuing careers in health care. Commitment to Social Justice: IMPACT Service Breaks for working to incorporate social justice into its service-learning spring and winter break strips that span 22 cities with 16 social justice topics. Outstanding Cross-Cultural Program: OUTLaw/Stonewall Law Student Association’s “Out: An Oral History of UGA Law’s Queer Faculty and Staff, an opportunity for faculty and staff to discuss their experiences navigating their LGBTQ identities at the law school and in practice. Outstanding Service to the Community (Small): Designated Dawgs for providing free, safe transportation for students on weekends. Outstanding Service to the Community (Large): Serving Others Unconditional Love (SOUL) for working with community service organizations to connect with underserved populations and build genuine relationships through meaningful conversations. Pillar of the Community: Kristina Petti of the Department of Germanic and Slavic Studies. Advisor of the Year: Lindsey Welch, advisor to the American Pharmacists Association – Academy of Student Pharmacists. Candice Sherman Emerging Leader: Autumn Pressley, Student Alumni Association. Bulldog Vision: Carly Esposito, co-president of Food2Kids.